Painting copies of artwork you admire is a great way to learn. Joaquín Sorolla is one of my favorite painters, so I can open “Joaquín Sorolla” (Museo Nacional Del Prado) to any page and find a work of inspiration to copy. Like this one. Funny thing is, I opened the book, and found later this is a detail of a larger painting! I had a feeling it was an odd composition (having the two people on the edge of the canvas), so it was nice to see the full composition on the next page. Even so, copying “Sewing the Sail” (1904) was a great lesson in composition and color. 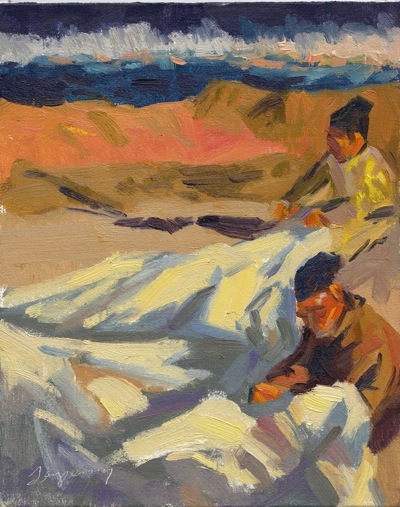 I learned how Sorolla used the folds in the sail to lead directly to the figures, and even the shadows in the sand. Look how the main shadow folds in the sail lead directly to the center of interest (foreground person). I was also surprised someone how intense many of these colors were, but how adding a complement (violet to the orange) would bring down the intensity just enough (although, comparing mine to his now, I see I should have used even more violet). This was also a great study in brushwork. The original is much larger, but I was able to adapt my brushwork to this scale (10×8) to lay down some juicy brushstrokes, particularly on the sunlit side of the sails.